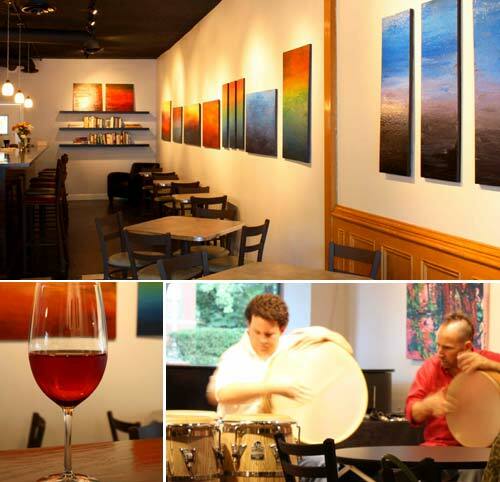 The Tavern of Fine Arts is the new place to be to listen to chamber music! Located north of Forest Park Parkway in the Central West End, the Tavern of Fine Arts offers a plethora of things to do and see! You can hear types of music like art songs, classical music, chamber music, classical guitar, even some jazz and avant-garde performances. The Tavern also offers space for visual artists to show their paintings. These get changed out every 3 months so there is always something new to see! Just want to sit and relax while listening to the music? The Tavern offers snacks, wine, and other beverages to enjoy while you’re there. You may be thinking The Tavern of Fine Arts is similar to Le Poisson Rouge in New York. And you would be right! However, the Tavern doesn’t have a cover charge. Win-win! The Tavern was thought up by cousins Aaron Johnson & Mathew Daniels. Both are 42 and both hail from St. Louis. Johnson & Daniels are musicians and teachers themselves so this was right up their alley. There is a lot of music and art to see to check out their website for more information and come on down for a night of fun music, art, and food!